Making her debut in John Schlesinger’s Billy Liar at the age of 22, Julie Christie ushered in the swinging sixties, landing a BAFTA nomination she announced herself on the national stage, before two years later reteaming with Schlesinger once more in the central role, she won an Oscar for Darling. At 24, the grandest prize in the profession in her grasp, Julie Christie played a second role that same year, and though it was the other that built her reputation, it was David Lean’s Doctor Zhivago that made her an icon. Proving diversity was in her grasp she displayed her range over the next decade, refusing to settle into comfortable roles, she starred in Francois Truffaut’s adaptation of Ray Bradbury’s Fahrenheit 451, alongside her much celebrated other half in Robert Altman’s lyrical western in McCabe & Mrs. Miller and with Donald Sutherland, in Nicholas Roeg’s grim, horror masterpiece Don’t Look Now. As time went by and her relationship with Warren Beatty grew, her interest in acting seem to dim, though working relatively consistently for the next few decades she turned down numerous major roles that had been major steps for other actresses from They Shoot Horses Don’t They? to Reds, moving back to the UK in the early 80s after her split from Beatty, she began campaigning for animal rights, nuclear disarmament, and numerous other causes. Eventaully in the mid 90s she began a career renaissance, first landing the role of Gertude in Kenneth Branagh’s Hamlet before going onto further supporting work and Oscar nominations for her beautifully subtle work in Afterglow and Away from Her. Though she may have priorities in other arenas, Julie Christie certainly makes it count whenever she steps on screen. Not a performer given to nuanced and subtle work, Gary Oldman is an actor that came from the stage and has never forgotten it. An artist that paints in loud, broad brushstrokes he still strives for the farthest row in the theatre whenever he appears on screen and he nails it out of the park basically every single time. Though loud and brash might be his game, there really isn’t anybody better at it, when Gary Oldman is on the screen, you can rarely tear your eyes away. Those screams, those pulsating veins, those glorious tics and twitches, and the absolute brutally perfect way he delivers every single line has been in evidence from his screen debut as Sid Vicious in the romanticized biopic Sid & Nancy, to his vicious, obsessive sports thug in The Firm to his ‘graduation’ across the atlantic, where ever since the turn of the 90s he has been blazing his way through Hollywood. There was Lee Harvey Oswald, Count Dracula, he hammed it up but was never dull in Leon, The Fifth Element, Air Force One and Lost in Space. He brought his blazing intensity to a role it fit like a glove playing Beethoven in the otherwise ordinary Immortal Beloved, and as the century turned he found himself reaching a whole new generation in as kindly a role as he had every tried his hand at, playing Sirius Black in the Harry Potter films, a role that shall ensure if, for whatever bizarre reason all else fails, Gary Oldman, will never be forgotten. In a 50 year career, Robert Bresson only turned out 13 feature films. A testament to his intrinsic and minutely detailed approach to his work, and to his refusal to bow to commercial restrictions, spending a great deal of his time struggling to find funding for his projects. Following early desires to take up a career in painting, Bresson found his way to photography before directing his first short film in 1934 before spending over a year in a POW camp during the second world war. This time in captivity along with his aspirations as a painter and Catholic upbringing, had a very great impact on his work. Catholicism in particular was reflected in the redemption, salvation, and exploration of human soul that permeated throughout his work. Termed the patron saint of cinema, a term that was not without merit, Bresson strove to define a new cinematic language entirely different from all other artistic mediums. Requiring numerous takes from his actors till all mannerisms and tics of the performer were stripped away and the raw naturalism that only cinema could find was all that remained. He argued for cinematography, how he sought to find it elevated above merely what was essentially the filming of a play to create a new language out of imagery and sound. Though his films were often seen as critques of French society and the wide world beyond, Robert Bresson was never less than an optimist when it came to the artistic possibilities of the cinematic medium. 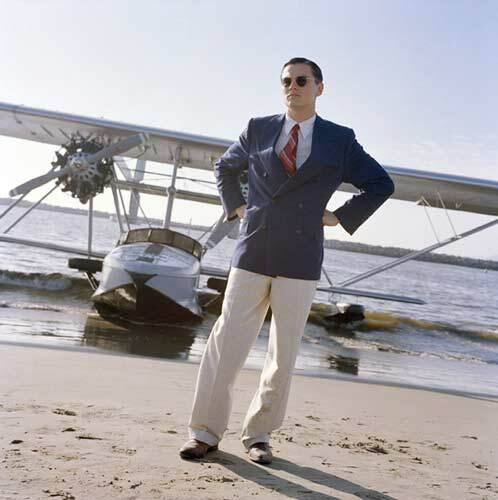 Too often simplistically dismissed as Martin Scorsese turning to old Hollywood glitz and glamour to land an Oscar, The Aviator is a flawed but fascinating epic of one trailblazer of a man overcoming the numerous seemingly insurmountable obstacles in his path only to be constantly plagued and felled by the demons within. In the central role, Leonardo DiCaprio plays Howard Hughes and graduates into adult roles with tremendous aplomb. Aging 20 years over the course of the film, DiCaprio begins the earnest, bright eyed boy that everybody knows, and slowly transforms into a gruff, stilted middle aged man, physically crushed by his exploits but still emerging triumphant. Howard Hughes was a groundbreaker, a 20th century pioneer, and Scorsese charts that innovation in the way that only cinema can, visually. Robert Richardson’s Oscar winning cinematography telling a visual story, entirely through images, charting the cinematic technology of the age, evolving as the years pass from the old two strip colour process to three strip saturated technicolour. Dante Ferretti’s production design compliments Richardsons work perfectly to add to the visual narrative, beginning with the giant, seemingly neverending expanse of youthful idealism and slowly closing in, trapping the titular Aviator in his own personal prison. Though the film is brighter and brimming with more glitz seen in any Scorsese picture this side of 1977’s New York, New York it is still unmistakeably his, a dark, troubled heart laying at its centre. Innovative and pioneering work, reigned in by humanity.